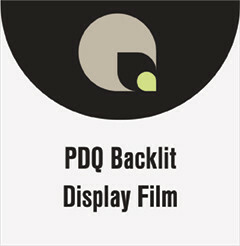 PDQ Backlit Display Film is an 9m translucent polyester film that can be displayed with either daylight or backlight. Its instant dry matte coating is designed for today’s pigment based aqueous thermal, UV curable and latex printers. Used as a backlit header for tradeshow applications. It offers high print quality, durability and light transmission. Thick base film makes a more durable graphic and waterfast, frosted surface has better adhesion and scratch resistance than other aqueous backlit films. Frosted surface also allows ink to dry instantly.